One day when I was a little girl watching my mom make dinner, I asked her why we weren't a "meat and potatoes" family. She said, "That's because we're Italian, and we eat good food." I remember thinking, was meat and potatoes bad food? Would it make you sick? I suddenly felt sorry for all those kids at school whose moms cooked meat and potatoes. I secretly wished I could bring them home for dinner so they could have good food like my mom's eggplant parmigiana, escarole and beans, and macaroni with gravy and meatballs. Other than the once-a-year New England boiled pot roast with potatoes and carrots, my mom never made meat and potatoes meals, and I don't either. The closest I get to making meat and potatoes is a burger and fries, which suits Jeff just fine since his mother also never made meat and potatoes. Since I'm a food blogga and since this week is about as wintery as it's going to get in San Diego -- 50's and rain -- I have decided to post some belly-warming one-pot meals. Everyone should have a basic beef stew recipe because it's easy, inexpensive, and satisfying. It also tastes great with beer and sports, so the men in your life will love you for making it. Rich red wine and beef broth along with earthy thyme add depth of flavor to this simple beef stew that is chock-full of firm carrots and potatoes. I guess I didn't need to feel sorry for those meat and potatoes kids at school after all. 1. In a large, deep pot, heat olive oil. Dredge meat in seasoned flour. Place in hot oil until browned, about 5 minutes (don’t overcrowd meat or it’ll steam). Transfer browned meat to a bowl. In same pot, add chopped onion and brown for 3-5 minutes. Deglaze the pot with the wine. (Pour wine in the hot pot and use a wooden spoon to scrape the brown bits from the bottom of the pot.) Add meat back to the pot. Cover the pot, and cook on low for 25-30 minutes. Add broth, potatoes, and carrots. Cook covered, on low heat until meat is very tender, about 1 hour, stirring occasionally. Add more broth if necessary. When meat is cooked, stir in herbs, salt, and pepper. Add fresh parsley before serving. Your mum's comment made me laugh! Though your stew certainly looks like 'good food' to me, and a very welcome dinner for a chilly evening. What a fun story! We didn't grow up on meat and potatoes either (I'm Asian go figure) but I wouldn't mind eating what you grew up with! I don't eat meat, but my family does. I know they would love this hearty dish! We had our share of meat & potatoes when I was growing up, but there were a lot of other things too like goolash, spaghetti, and macaroni & cheese. You know. All the stick to your ribs & fatten you up stuff. We were skinny little things. Let's hear it for our winter weather finally arrived. Yummy stew is perfect! Funny thing about families. My husband was definitely raised 'Meat and Potatoes'. He actually never ate pasta or rice once until he went to University! (Thank you, Northern England upbringing!) We love beef stew! I always swap out 1 cup of the broth for 1 cup of coffee. It adds another flavor of richness that you wouldn't expect. My mother always cooked with a meat main dish as the centerpiece, but she also grew her own vegetables, so the "potatoes" part was usually a combination of home grown veggies. So I guess I grew up with a foot in each pot! Love your stew, Susan. lickedspoon-It makes me laugh now too. maria-That's nice that you still cook for meat them. amber-Never ate pasta or rice? Whoa! That's hard to imagine for me. I love the idea of adding coffee. I'll have to try that. christine-"A foot in each pot." I love that. If they're eating this recipe, those poor kids are well-cared for! Susan, I often use beer in my stew, but when I use wine I use about 3/4 beef stock and 1/4 red wine. Then, just before serving I add a healthy splash of wine to the stew, this enables you to actually taste the wine as a separate ingredient and is way good. My husband grew up in a meat-and-potatoes house, and I've learned to make a mean beef stew for him. I don't really eat it, but I love to make it, with lots of root vegetables like turnips and parsnips and rutabaga. This would be a very comforting dish Susan. What a cute story!! And I loved Amber's idea of adding coffee...awesome tip! hehe... you mom's cute, you were even cuter! Looking at this succulent stew, I realize that I was so deprived when I was a kid :D :D Have a wonderful new year! 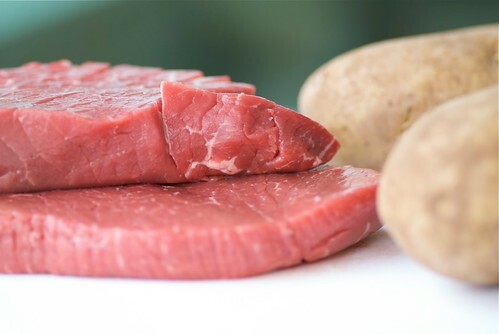 My husband is definitely a meat-and-potatoes guy, and this is his kind of dish! I love stew, but only once a season or so - and I move on to other, lighter soups. But stew is an important part of winter! Sounds like San Diego is having more wintry weather than we are this week in Dallas - high will be 74 today! I love meat and potatoes!! 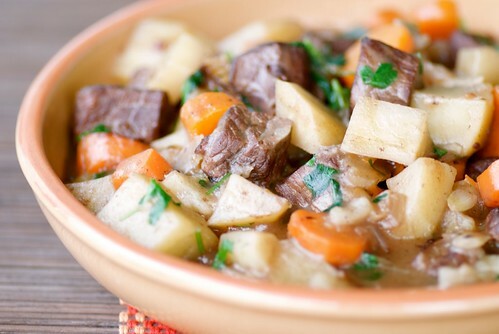 Your beef stew looks so delicious. I am doing one in the next week using the pressure cooker! I totally love your mothers way of thinking. I grew up in a NON meat and potato house too. Hey, I feel like I know your mom because I've been eating her biscotti all week. She's right about stew, but I make it anyway. The family likes it and it smells good. That recipe looks like fun and I like that it calls for a cup and a half of red wine. I'm always looking for ways to use up half bottles that I liked but didn't love enough to finish. tw-That's awfully nice of you! kevin-That's a great idea to add a splash at the end. I'll have to do that next time. Thanks, Kevin! rambling tart-That's great that now you enjoy many different cuisines! lydia-There is something relaxing about making a stew. mark-You just made my mom smile, no doubt. kelly-That was a great idea! tastyeatsathome-74? You'd better getting the fireplace crankin', girl! teachercooks-I don't even own a pressure cooker! anna-You're eating her biscotti? Yay! That will really make her day! Even though it sounds like a lot of wine, it's not overpowering. mary-It warms your belly really nicely. I love that! But I did of course grow up in a meat and potatoes (and bread) family. With a side of green beans. What a perfect meal in a bowl! Susan, this is a fab stew. The tougher cuts take longer but always more flavourful...wicked-awesome! thanks for the shout-out! Also, love your story and your stew. Growing up in Cooperstown NY (frigid winters!) we had lots of belly warming stews like this. My Dad was an M&P guy, but Mom was more for the Italian fare so our cuisine was 50/50. I have to say, I take after my mother. I do a steak frite now and then, but stick with pastas over the pot roast. Rainy, rainy weather deserves hot beef stew. Perfect timing. I made this yesterday. It was hard to wait the necessary time to cook, but the wait was well worth it. I actually dumped a cup of rice (and an extra cup of beef broth to compensate) in because I had it lying around. It turned it into a really delicious gumbo with the addition of cumin and some Tabasco.